So I wanted my landscaping tool kit since most of my tools were getting up there in age and had a lot wear and tear from the use. However I had truly forgotten how much each individual tool actually cost! The first time around I had built up my tool kit through the years depending on the needs that I began acquiring. As I started liking it more and more I began doing most of the landscaping work on my property by myself. So dishing out 100 dollars every once a year on a lawn mower or chainsaw was not that big deal. But now having to spend 500+ dollars all at once was a little harder to swallow. Doing some research on how I could get this done without breaking the bank I came across the Trimmer Plus products. Essentially they are whole toolbox that can be combined into one. You have one motor with interchangeable heads that allow you to saw, cut, prune and everything in between. However I was still not convinced. It looked like one of those cheap products right out of an infomercial that tell you they are a modern swiss army knife, but when you get them they break easily or don’t really work properly. The only thing that made me try it out was that I could attach it to really the gas powered motor of my choice. So what I did was I bought a compatible motored tool that I knew perfectly had a powerful and reliable motor. That was half the battle. The first tool I actually bought was the TrimmerPlus PS720 8-Inch Pole Saw with Bar and Chain. It really worked wonderful. The automatic oiling feature was a big turn on in my eyes as it was one of my main concerns coming in. How would the oiling work for each of the tools. However each of them has their own way to keep lubricated. The TrimmerPlus PS720 8-Inch Pole Saw with Bar and Chain not only gives you the advantage to stack up tools with one single device. It also lets you choose what the perfect fit really is! It connects perfectly with attachment-capable trimmers, including Troy-Bilt, Remington, and Craftsman and much more. You can essentially take it to the store and measure which one of the trimmers is a best fit for you. I said earlier that the gas powered one’s where my favorite, but if you feel the need to go green you could also go with an electric motor. I just don’t like batteries or being plugged into a socket all the time. So it's basically a total hybrid in every way. 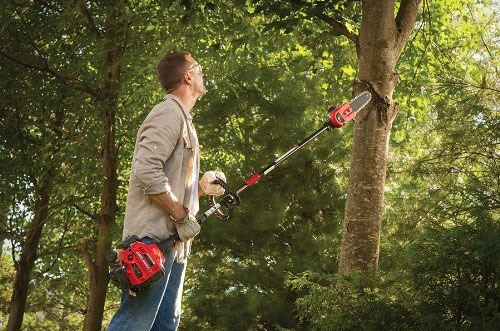 With an 8-inch bar and chain that features an auto oiler you rest assured it saws through branches with ease. The pole extends up to a 7 foot length which basically means it has a reach of over twelve feet depending on how tall the operator is. There is really no good reason for anyone to still try and buy a ladder for landscaping. Also it is an incredibly lightweight product. The extension plus the saw only weigh around 3.4 pounds when put together. Which means that if you choose a light trimmer to combine it with you can really prune effortlessly even tough and high branches. About The TrimmerPlus PS720 8-Inch Pole Saw with Bar and Chain? This product has a very good rating in most sites. Amazon users rate it at a 4.3 out of five, and it is also the number one selling product in its class. So even if you are not the biggest fan you can’t deny that they are doing something right. However there are a couple of doubters and detractors out there and here are a few things that they typically say: The chain comes off easily and the oiling process does not work properly. Those of you that have been around these types of products for long time will agree. If 30 min into your first use something went wrong there are only 2 possible answers. One the product is just straight up garbage. In this case It would seem odd if it was, because then that would mean the manufacturers had to have paid off way too many people to say that it's good.The second option is that you took it straight out of the box and where so eager to play with it you never even bothered to read the manual and learn its proper use! ​A lot of the negatives reviews sound like the latter. Whenever these products with an automatic oil systems pop up there are always angry customers saying the feature does not work properly. Let me give you a tip: It’s really hard to send well oiled parts and products through the mail. In many occasions many of the parts, especially interchangeable ones like the saw and pole in this case will lack the proper oil levels to function correctly. I agree it is the manufacturer’s job to give out these types of warning, which they typically don’t do, but at the end of the if it’s not this product it might be the next so keep that in mind. Don’t just take everything out and start playing like a kid with a birthday gift. I know that is what we all want to do, but first make sure everything is working properly. If you fire it up and mess up the chain for lack of oil the manufacture might not want to redeem your 2 year warranty because of the faulty use. Many of the people who gave it the proper use are happy with the quality of the product. Especially the fact that they were able to attach it to the tool that was most comfortable for them. All in all I usually don’t recommend buying inspector gadget like variety tools. However the TrimmerPlus PS720 8-Inch Pole Saw with Bar and Chain can get the job done just as well as normal pole saw. Especially the ones that are in its price range. Our biggest plus on this tool is versatility, the fact that you can attach any universal head to the shaft makes it a great buy for the long run. You can always have this pole, and then buy any attachment out there, capable trimmers come from big names like Troy-Bilt, Remington, and Craftsman, so you know you can always add a new saw or trimmer to this pole set. As always it also depends on how heavy duty your needs are. Even how old school you are. However if you are looking to upgrade from basic tools this could totally be a good bet! If you want to get to know more about the TrimmerPlus PS720 8-Inch Pole Saw with Bar and Chain and all the Trimmer Plus tools you can incorporate to your tool kit don’t hesitate to visit amazon. Here you can read many other user reviews and look at real photos of the product to see if this is the tool set for you!